The Stevie Wonder biography, compared to many Motown singers' stories, is refreshingly turmoil- and heartbreak-free. That's just one of the distinctions Stevie Wonder has held as a boy, man, and artist. After his premature birth on May 13, 1950, Steveland Hardaway Judkins went blind, probably due to a visual ailment plus excess oxygen in his incubator. The condition didn't limit him. His family moved from Saginaw, Michigan to, fatefully, Detroit. There, his apartment neighbors encouraged the pan-banging kid by giving him bongos and an old piano. His collection soon grew to include a harmonica and drums. One day in 1961, his friend's cousin, Ronnie White of the Miracles, caught one of Steveland's front porch bongo jams. With White's help, the 11-year-old auditioned at Motown. He immediately joined the company as Steveland Morris (the new surname followed his mother's marriage). A compliment by Berry Gordy reportedly led to the stage name, Little Stevie Wonder. Wonder's opening pair of albums with producer Clarence Paul didn't chart well. But 1963 brought "Fingertips, Pt. 2." The electrifying harmonica single with the notorious encore shot to pop's #1 spot--a first for any live performance. Its album, The 12-Year-Old Genius, did the same--the first for Motown. Wonder wouldn't hit big again for a while. In the meantime, he received guidance from Funk Brothers Earl Van Dyke (keyboard) and Benny Benjamin (drums), and took piano lessons outside the studio. Less serious pursuits included mimicking Berry Gordy and pinballing between rooms, conversations, and pranks. Finally, the beat-happy "Uptight (Everything's Alright)" topped the charts in 1965. Co-written by the no-longer-little Wonder, its success spurred him to develop his composing--and singing, and producing--talents further. Ballads got more of his attention later that decade. He shared some writing and producing credits on 1968's For Once in My Life. (Many would mistake the title song, an original by Ron Miller and Orlando Murden, as a Tin Pan Alleyish classic!) 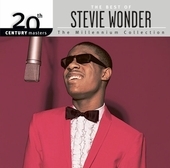 "My Cherie Amour," a Stevie Wonder recording from 1966, also made waves. Next came Signed, Sealed and Delivered, the first album he wholly co-produced. By the time he released 1971's Where I'm Coming From, the "co-" had vanished. He wasn’t completely independent. Syreeta Wright, an occasional backup singer, a promising lead, and his fellow songwriter on that album (as well as "Signed, Sealed, Delivered (I'm Yours)") had married him the year before. The Stevie Wonder biography has reached yet another grand moment: his 21st birthday! Yes, great for him, but maybe not for Motown Records, whose contracts with juvenile artists expired on those dates. Where I'm Coming From had featured synthesizer-heavy pieces that unleashed more colorful and complex sonic layers into R&B. His updated contract would let him make equally strong statements in the future. It guaranteed total artistic control over his music. Copyrights to his music through his own publishing company. Fifty percent of the publishing royalties for his music. And a colossal $13 million for another seven years at Motown. At the same time, Stevie Wonder's royalty-stuffed trust fund paid for the studio where he'd record his most ambitious, unified albums. Aptly, he titled the first of those works Music of My Mind. The Stevie Wonder biography's next chapter involves ends and beginnings. On the personal front, he and Syreeta Wright divorced, but stayed close as he helped develop her first solo album. Professionally, away from Motown's assembly line, the sophisticated composer within him fully surfaced. While '70s Stevie Wonder songs were still technically Motown songs, the sound was all his: cosmic yet grounded in R&B grit, lovely yet funky, harrowing yet seeded with hope. Even the industry got it, bestowing several Grammys to Stevie Wonder for Talking Book's "Superstition" and "You Are the Sunshine of My Life." Across the socially sharp Innervisions of 1973 (which included his urban tale, "Living for the City"), two more Albums of the Year, and over a dozen other wins, his Grammy stockpile would rival his instrument stash! But midway, his momentum halted. En route to North Carolina, a log tumbled off the back of a truck and onto Stevie Wonder's car. His head injuries were massive enough to send him into a coma. He eventually bounced back, but not before losing his sense of smell. Fortunately, that's the sole catastrophe in this Stevie Wonder biography. The accident renewed his spirituality, and his music stayed as potent as ever. 1974's reflective Fulfillingness' First Finale contained "Boogie on Reggae Woman" and the anti-Nixon "You Haven't Done Nothin'." It won Album of the Year Grammy #2. In two more years, the multipart Songs in the Key of Life sprang from his studio as his dazzling (though to some, unwieldy) masterpiece. Stevie Wonder’s "Sir Duke," "Isn’t She Lovely," and "I Wish" bounded across, graced, and rocked its grooves. Album Grammy #3! He snapped his own streak with 1979's Journey Through the Secret Life of Plants. The soundtrack to a defunct documentary, it was soft, unearthly, and baffling to most. 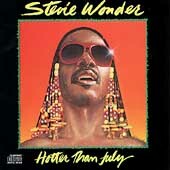 With the Bob Marley tribute, "Master Blaster," Stevie Wonder returned to his pop roots in Hotter Than July. That album also reminded the public of his sociopolitical concerns. "Happy Birthday" supported a national holiday for Martin Luther King, Jr., which Wonder aggressively advocated. In 1982, he pitched racial idealism more gently in "Ebony and Ivory," a duet with Paul McCartney. In fact, after a compilation of Stevie Wonder hits called Original Musiquarium, benign pop would define (too) much of his new output. Best Song Oscar winner "I Just Called to Say I Love You" and "Part-Time Lover" at least sustained his commercial clout. We haven't said goodbye (goodbye! Goodbye goodbye!) to this Stevie Wonder biography or his gifts yet! You know the Spinners' "It's a Shame"? The Miracles' "The Tears of a Clown"? Both carry Wonder's stamp, as do current jazz and soul artists who seek his special touch. Stevie Wonder entered the Rock and Roll Hall of Fame in 1989. More importantly, he's entered the pop stratosphere as well as Motown's. He's a musical superman who, with awesome arrangements or a few cheery puffs on his harmonica, keeps thrilling the world while doing his part to save it. ...including the recorded testaments to his talent. Want more content like this Stevie Wonder bio? Get loose with other Motown oldies artists on the homepage!